Each week of our future of dining editorial series, we’re sharing an interview with one of our Hack//Dining NYC collaborating partners. We’ve shared Q&A with celebrity chef Mario Batali, with Michiel Bakker, Director of Global Food Services at Google and Gina Asoudegan, Director of Communications for Applegate. To round out the partner Q&A’s, we’re excited to share our conversation with Chipotle’s architecture and design team, Mick McConnell, Reed Finlay and Michael Russo. The trio discuss how and why they’re striving to improve operations through sustainable restaurant design. “We continue to develop our unique approach to minimizing impact and maximizing the quality of the user experience with each store, and promise to continue innovating into the future,” the team tells us. They also dive into the challenges they face. Check out our interview below to learn all about Chipotle’s architecture and design team’s vision for the future. Learn more about Chipotle’s hackathon challenge here. Food+Tech Connect: Why is improving the environmental sustainability of the design and operations of its restaurants a priority for Chipotle? Chipotle: As part of our mission to change the way people think about and eat fast food, we’re constantly looking to improve every aspect of our operations. The obvious component of this is our ingredients—Chipotle is committed to serving fresh, high-quality, responsibly produced food to our customers. But this thinking extends beyond the ingredients we use to every aspect of our supplier, employee, and customer experience. Designing restaurants with the same integrity with which we approach our food sourcing falls perfectly in line with this ethos and furthers Chipotle’s commitment to cultivating a better world. FTC: How do you define sustainable spaces? C: A sustainable space is one that considers the complete life cycle of the project. Chipotle strives to minimize the environmental impact of the real estate we occupy through energy efficiency, material recycling and reuse, water management, better indoor air quality and post-demolition impact. FTC: What is Chipotle’s current approach to designing environmentally sustainable spaces? C: Chipotle has a rich past in sustainability that goes back to it’s very first restaurant which was built from locally sourced, recycled, low-energy materials such as barn metal and plywood. Throughout the years we have developed a sustainability palate with every restaurant, including a few buildings which incorporate renewable energy production through solar and wind power, water reclamation, air quality optimization and efficient material sourcing. Chipotle’s design goals also address the human factor of health and wellness. The quality of each and every space is also important. Qualitative factors such as lighting, ambient sound, music, a material’s tactile quality and more are evaluated and prioritized. We continue to develop our unique approach to minimizing impact and maximizing the quality of the user experience with each store, and promise to continue innovating into the future. FTC: What are the greatest challenges Chipotle faces with improving the sustainability of its operations? C: Our operations are all about people. People use the spaces we design in two ways: as customers and crew members. Much of the actual environmental impact of a physical place is determined by how people use it, so we are striving to design spaces that build in the more sustainable choices and behaviors as a default. FTC: Why is Chipotle participating in Hack//Dining NYC? C: From the very beginning, we have always started from a point of curiosity and approached any situation knowing that we have a lot to learn. That’s why we’re constantly visiting farms, ranches, and other suppliers, and constantly trying to examine how we can do better. Hack//Dining is first and foremost a learning opportunity for us. We think we have a lot to gain from engaging with the tech community on some of the challenges we face—and we hope they’ll learn something from us too. FTC: What will Chipotle restaurants look like in 5 years? 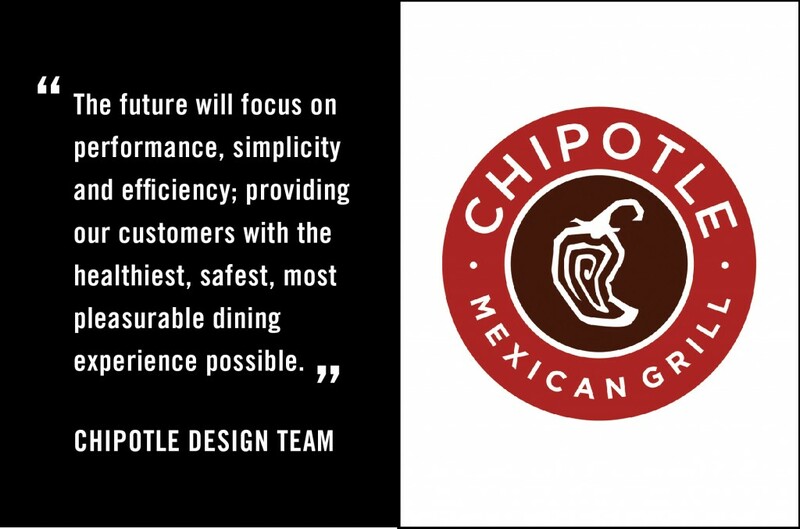 C: Chipotle will continue to let the fundamental goals of integrity and authenticity drive the development of our restaurant design. The future will focus on performance, simplicity and efficiency; providing our customers with the healthiest, safest, most pleasurable dining experience possible. Hacking Dining is online conversation exploring how we might use technology and design to hack a better future for dining. Join the conversation between June 2-30, and share your ideas in the comments, on Twitter using #hackdining, Facebook, LinkedIn or Tumblr.